So accurate are pulsar signals that when they were discovered, astronomers gave serious credence to the idea that they were evidence of intelligent life elsewhere in the Universe because they were unmatched by anything physicists could make on Earth. This has lead to the widespread belief that pulsars are the most accurate clocks in the Universe. John Hartnett and Andre Luiten at the University of Western Australia want you know that’s no longer the case. 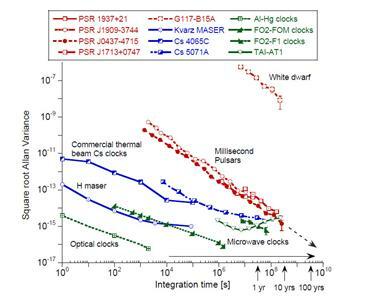 Today, the best optical lattice neutral atom clocks and trapped ion clocks have a frequency stability approaching one part in 10^17.By contrast, as more pulsars have been discovered, their timing stability has improved by less than an order of magnitude in the last 20 years. The best millisecond pulsars have a stability of only one part in 10^15 at best. That means that terrestrial clocks can rightly be crowned the best clocks in the Universe, say Hartnett and Luiten. Duly noted. It seems worth pointing out that the measure of accuracy in the article is expressed as a ratio without units – often you hear that an atomic clock will lose a second of accuracy only every 10 billion years or so. The author of this article avoids that, and maybe for good reason. Sometimes people told Long Now is building a 10,000 Year Clock react by asking, “Oh, like an atomic clock?” It seems that an occasional side-effect of using these long time units to illustrate the accuracy of atomic clocks is the implication that they will be around for eons. The thing is, atomic clocks rely on vacuum-sealed chambers full of cesium atoms kept near absolute zero or similarly complicated mechanisms to make their extremely precise measurements. That kind of hardware requires a significant technological, economic and bureaucratic infrastructure to maintain. If you can imagine finding an atomic clock after the electricity failed that kept it running, you would have to recreate a lot of knowledge to understand what in fact it was. The article goes on to discuss the difficulty of building a timepiece durable enough that its lifespan requires scientific notation to describe, and mentions Long Now’s attempt through the Clock of the Long Now. It’s in this endurance category, however, that pulsars maintain their dominance, as they’re likely to last quite a bit longer than anything humans have been able to build, even Long Now – we’ve been able to observe some that are thought to be around 200 million years old.